(Photo: WCC / Peter Williams)World Council of Churches 10th Assembly at Busan, South Korea. .Korean and overseas Assembly delegates and participants mingle on stage at the end of a Korean historical presentation during the opening ceremony on October 30, 2103. BUSAN, South Korea - They dance and sing and an orchestra supports. Confronting images, combine to tell the story of their nation and its Christian history. It is the Korean Church's way of telling their story and welcoming delegates to the opening session of the World Council of Churches 10th Assembly now underway in Busan until November 8. Two enormous panels reaching from floor to ceiling, reminiscent of the rusting iron sides of ships, stand foreboding across the stage at the voluminous Bexco convention center auditorium in South Korea's second biggest city. A deep blue light emits in the small gap between them as what sounds like an ancient gong beats like rolling thunder. The 4,000 plus people gathered from four corners of the world hush. A lone man in straw white clothes and large brimmed, black hat is suddenly there in the centre of the stage. The large iron walls draw back and two white lights beam down on him. He's playing an ancient flute – an eerie bamboo sounding rhythm drifts across the audience. It evokes Asia for Westerner's in the audience. Black and white calligraphy style images of the land emerge behind the man and the iron walls are transformed into images of life as pictures of fauna and sunlight and glow on the walls. A quick glance away from the evolving, mesmerising simplicity, to the side and the large screens at the side show us the first poetic words from St. John's Gospel: "In the beginning was the Word..."
We realise old man is playing the Gospel account of the coming of the Word. As the music rises and falls we read o the light coming and the darkness did not extinguish this light. Suddenly a troop of dancers are racing diagonally across the stage: rolling, tumbling life. The montage behind is about missionaries coming and the dancers are showing us preaching, teaching and healing. Sepia toned silent movie images file across the back screen like an old fashioned slide show: serious European men (well, all except the one female) with stiff clerical collars, beards and deep set eyes. It is as if life has at last arrived on the Korean peninsula. Now it's the Pyongyang Revival of 1097. The images of church leaders has changed: now they are all Asian men, but with the same deep, seriousness. The dancers are now a choir and in song as they work. Optimism takes hold of the audience. They clap, but too soon. Almost immediately dancing and images change: Japan is invading. The montage of the marching Japanese invaders pervades the stage as the dancers now act out the persecution of Christians. Golgotha is formed on the walls by the shadows of the dancers as they carry each other in cruciform shape across the stage. An operatic tenor sings out: "Father God, Father God, death is everywhere... Father God, bring us peace." A bell tolls and there indeed peace - it is now August 15, 1945. War is over and traditional dancers spring in circles drumming and flinging long ribbons about from their pop-pom style hats. This springing frenzy has the audience applauding once again, and then with a sad familiarity it all stops...peace did not come: it is June 25 1950. A U.S. radio voice is announcing the Korean War; the DMZ (De-militarized zone) has been drawn on the 38th parallel. A nation and a people are divided. The dancers are writhing in pain, there is confusion as figures flash up before us: 615,000 killed, 100,000 war orphans, 10 million families separated in the North and South. Two ballet dancers intertwine is sorrow and grief: and an opera singer leads a lament. "Lift your eyes and look to heaven" she sings. No clapping now. Somehow, it's July 27, 1954 hostilities have ceased, but not the pain. A tenor voice continues the struggle: "O Lord of here and now, be with us here and now." The people take to work, building a nation: dancers shovel, and build and stretch and hoe. The music is now more like a song of revolution and work. The song ends with rising hope: "Amen! Amen!" The emotions of the crowd have risen and fallen and fallen some more, so now with victory and hard work in front of them they clap and cheer with vigour to match the hope and relief. The screen says, like the Israelites of the Old Testament the people of Korea have experienced the separation, the pain and struggle for life. There is evangelical zeal to spread God's word once more. The World Council of Churches logo descends and the people dance. There are 66 of them on stage and hearts are raised in joy and also in the audience. "God of life lead us" says the song sung. 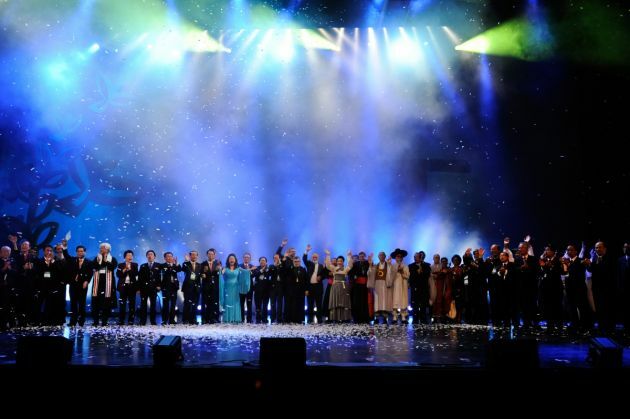 The ecumenical leaders are led on stage: it is snowing with white confetti and the audience stands and applauds. Church leaders in pressed suits, bishops in purple, Catholics in Vatican black with red cummerbunds, Buddhist monks and one guest still tightly clinging to his WCC tote bag greet each other in a line across the stage. The story has been told of division, disunity and war in the host nation: now it is on to business of seeking unity, or in the words of the WCC's conference theme: "God of life, lead us to justice and peace."